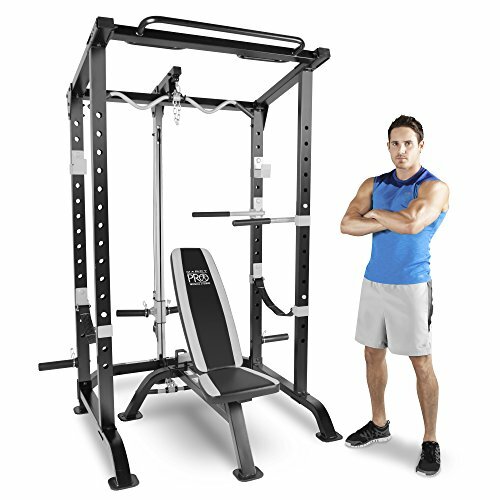 Perfect for your basement, garage, or workout area in your dwelling, this Marcy Pro Full Cage and Bench System is jam-packed with exercises that help you maintain a toned and fit physique. This cage and bench system not only makes your workout area look sleek and sophisticated, but it makes your body look the same. With heavy-duty steel construction, it's sturdy and durable for many years of home workouts. It has a maximum user weight of 300 pounds and a maximum weight of 600 pounds on the bench. The bar and weights are not included, but can be easily incorporated with this system. Save time and money by weight training in the comfort and convenience of your own home with this Marcy Pro Full Cage System.